Webbwood's prosperity in the late 1890's and early 1900's was due to the many lumbering companies that were at work in the area.As early as 1892, when the C.P.R. was building the spur line between Sudbury and Sault Ste. Marie, two lumber companies, Spanish River Lumber Company and the American Lumber Company, were already logging in the area. The following list names many of the lumber companies who operated in the area over the years. 1882 Spanish River Lumber Co.
1892 Cutler and Savige Lumber Co., McFadden and Malloy Lumber Co.
1907 White Pine Lumber Co.
1908 Wolverine Cedar and Lumber Co.
1910 C. Beck Manufacturing Co.
1942 1942 Frank Currier Ranch and Logging Co. Early records show that lumber companies usually tried to get the lumber rights to an entire township. After the area was scouted, a bush camp was erected. Bush camps included bunkhouses, stables, blacksmith shops, offices and cook houses. Camp Foreman were in charge of the camps. Foreman usually had an assistant. Other members of the camp included a clerk, saw filers, log scalers, blacksmiths, cooks and cook's helpers. Between 100-200 men could be employed by each of these camps. Evidence of this is shown in the 1891 census of Hallam and Graham. 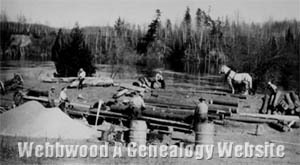 The Webbwood District employed about 2000 loggers each season, as there could be upwards to ten camps operating at one time. Webbwood, being close to these camps, boomed in the early 1900's as the camps were supplied by the local businesses and many of the lumbermen's families resided in Webbwood. Crown timber agents were stationed at Webbwood until about 1915. The 1901 census shows Edward Garrow as a crown timber agent. Logging camps were usually 4-5 days travel from the nearest town. Supplies were taken in either by horse and wagon in the summer or horse and sleigh in winter. Usually camps consisted of cutters, teamsters, cooks, cookees, foreman, camp boss and a chore boy. Early camp bunkhouses were shanties made of logs and chinked with moss, and roofs of tar paper strapped with board. Beds were bunks made of spruce poles and had mattresses of balsam boughs. Cooks usually served meals of salt pork with beans and molasses, potatoes and bread.